MTV News is reporting that Brad Pitt is now officially attached to star in the big screen adaptation of WORLD WAR Z as confirmed by author Max Brooks. 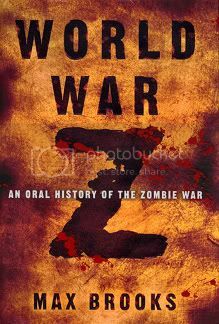 While chatting up "World War Z" author Max Brooks at the booth for comic publisher Avatar Press, the writer confirmed to MTV News that the adaption of his novel about the zombie apocalypse is not only moving forward, but Brad Pitt is now officially attached to star in the film. Additionally, Brooks revealed that Paramount has optioned the movie rights to two more of his projects: "The Zombie Survival Guide" and "The Zombie Survival Guide: Recorded Attacks" graphic novel. Pitt was already assumed to be the almost certain lead based on the fact that the novel had been optioned by his own production company, Plan B Entertainment, back in 2007. For now, we’re looking at a Summer 2010 release date. That day cannot come any too soon as far as we’re concerned but it’s better that Paramount not rush it and take the time to get it right. "I'm glad they took their time, and are trying to make the best zombie movie they can," said Brooks. "I'm so glad they stayed with the project and so glad they found the right team."